Kyle Keeley and his teammates, Miguel, Akimi, Sierra, and Haley are back. Kyle and his friends have become celebrities, starring on television commercials for Luigi L. Lemoncello’s wacky games and being asked to endorse all sorts of goods thanks to their famous win in the first ever game (and book) of Mr. Lemoncello’s. But it’s not long before sour grapes begin to grow from Charles Chiltington and his teammate Andrew, who lost in the first game (and first book: Escape from Mr. Lemoncello’s Library), as well as from children Kyle and his team have never met—all claiming they could have beaten Kyle’s team if they’d been given the chance (the original Lemoncello game was only open to local residents). Mr. Lemoncello’s Library Olympus works as a stand-alone novel, so not reading the first one won’t cause readers to be lost in the flow of the narrative. Mr. Lemoncello, librarian extraordinaire, has invited teams from across the United States to compete in the first-ever Library Olympics after floods of messages arrive that kids across the country are upset that they hadn’t the chance to compete in the first game. Charles and Andrew also demand a rematch, and Mr. Lemoncello responds with the Library Olympics—kids will have to complete to join regional teams that will then come to Alexandriaville (named after the greatest world library established in the 3rd century BCE in Alexandria, Egypt) in Ohio to compete against the winners. The games in this Olympics feature a duodecimalthon of 12 library-related games, from solving Dewey decimal related puzzles (Dewey decimal is the call number organization method of public libraries) to identifying banned books. All of this takes place in the most advanced and modern of libraries, the Lemoncello Library, which is the Monticello of its day with advanced ladder systems and virtual reality games. Readers will be encouraged to play along with Kyle and his teammates as they rush to solve puzzles and decipher the clues—all why trying to foil the Chiltingtons and their attempt to shut down Lemoncello Library. And if readers look closely, they may be able to solve the hidden puzzle in this book (just as there was a hidden puzzle in the first). 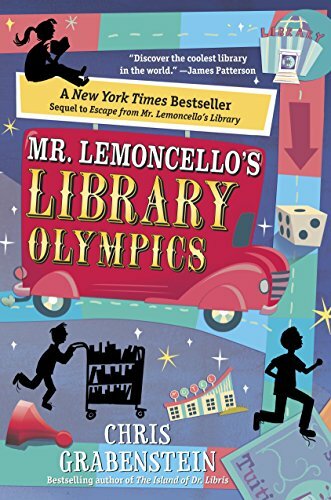 At the core of the games, Mr. Lemoncello is looking for true champions of the library and literature, children who will support the first amendment and the right to read. Banned books is a strong theme running throughout this sequel. Books are being removed from the library by theft, deviousness, and by checking them out and renewing them repeatedly—but who could be doing it? Is it Mrs. Chiltington trying to ban books she thinks are dangerous? Or is it Charles Chiltington, still a sore loser and wanting to make the competition difficult? Or perhaps Andrew? Or maybe it’s his sneaky uncle who passionately hates squirrels, especially those that talk? Author Chris Grabenstein has written an ode to libraries, literature, and puzzles that will encourage any child to look again at her local or school library and wonder what treasures are hidden inside and what the librarian at the counter is really like. This is written with grade school and middle school children in mind, but adults, especially librarians, will revel in this beautiful book. If readers enjoy Roald Dahl, they will enjoy Mr. Grabenstein. At the back of the book is Mr. Lemoncello’s Library Olympics Book List (all those books mentioned) for readers to add to their stash of must-reads.